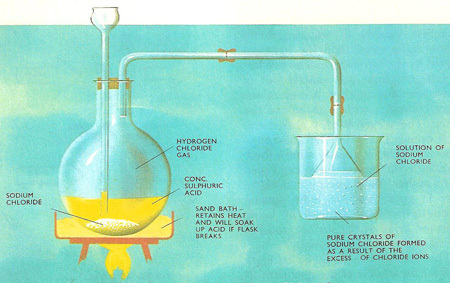 Purification of sodium chloride. The concept of solubility product can be used in purifying a comparatively soluble substance. For instance, sodium chloride may be purified by passing hydrogen chloride gas into a saturated solution of the salt. As the solution is already saturated, increasing the concentration (or active mass) of either sodium or chloride ions brings about crystallization. This is known as the common-ion effect. So pure crystals of sodium chloride come out of solution leaving impurities behind in the solution. If, when a saturated solution of silver chloride is made in 1 liter of water, only 100 molecules ionize, the solubility product is 100 × 100 = 10,000 (100 silver ions and 100 chloride ions are produced). 150 molecules of hydrogen chloride (150 hydrogen and 150 chloride ions) are then added. This immediately raises the concentration of chloride ions to 250 and the product of silver and chloride ions to 250 × 100 = 25,000. As this is higher than the solubility product, some silver chloride comes out of solution so reducing the concentration of silver ions. 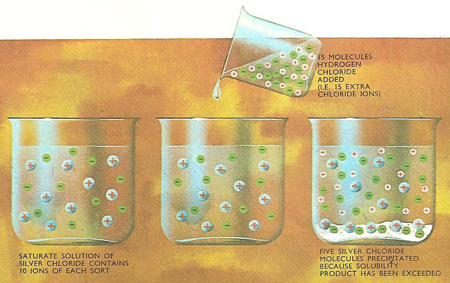 If the volume of hydrochloric acid is neglected, precipitation will continue until 50 molecules of silver chloride have been removed – the concentration of silver and chloride ions in solution is then 50 and 200 respectively and the solubility product is again 10,000 (50 × 200). If the concentration of the silver and the chloride ions in a saturated solution of silver chloride is represented by the vertical and horizontal sides respectively of a rectangle, the area of the rectangle represents the solubility product. This sequence of diagrams shows how the concentration of silver ions gets less as the concentration of chloride ions is increased. The system of analysis used for identifying the metallic ions present in a mixture of inorganic compounds depends upon the very low solubilities of certain salts of the metals. Silver, lead, and mercury (I) ions are detected first because a precipitate of silver, lead, or mercury (I) chloride is formed when hydrochloric acid is added to the solution. Then the metals whose sulfides are insoluble in acidic solution are separated by passing hydrogen sulfide gas through the solution. So, in turn, all metals are separated into groups. When salts are dissolved in water, and all of them dissolve, if only very slightly, some of the dissolved molecules divide up into ions. For example, each molecule of sodium sulfate which ionizes yields two sodium ions (each with a single positive charge) and one sulfate ion with two negative charges. Molecules of silver chloride split up into equal numbers of silver ions (with single positive charge) and chloride ions with single negative charges. Because they dissociate (split up) into ions, these substances and called electrolytes. With some electrolytes almost all the molecules split up into ions while only a few molecules of other electrolytes ionize in solution. A strong electrolyte is one which is largely dissociated into ions, while a weak electrolyte is one which is only slightly ionized in solution. Even some electrolytes which are only slightly soluble (e.g., lead chloride) dissociate to some considerable extent and rank as fairly strong electrolytes. When a salt which is only slightly soluble has been in contact with water for some time, the water will have become saturated with the salt – no more of the salt will dissolve. But although the concentration of the solution cannot increase at the particular temperature, some molecules of the salt will continue to pass into solution while an exactly equal number will crystallize out. Equilibrium will also exist between the dissolved molecules and the dissociated ions – no sooner has one molecule ionized than other ions come together to reform a molecule. By applying the law of mass action to this equilibrium, it follows that the product of the concentrations of the ions produced when the solute molecules ionize will also be constant. This constant, which is, of course, dependent upon temperature, is called the solubility product. If, for any reason, the product of the ionic concentrations rises above this figure for the particular solution, precipitation will take place and will continue until the product has fallen to the original level. One of the most important consequences of this is that the solubility product can be exceeded by increasing the concentration of either of the ions. Silver chloride can be thrown out of solution if the concentration of silver ions is increased by adding silver nitrate solution or if, by adding hydrochloric acid, the concentration of chloride ions is raised. In qualitative analysis the systematic separation of the metallic ions into groups serves two purposes. It makes possible the identification of the metals within each group, and also removes the metallic ions group by group. Otherwise the identification of the ions in subsequent groups would be hindered by the presence of a few remaining from the previous groups. It is of the utmost importance, therefore, that the Group I ions (silver, lead, and mercury(I)) are removed as completely as possible before starting to test for the Group II ions. But the chlorides of silver, lead, and mercury (I) are all slightly soluble, so special precautions must be taken. If, for instance, the original solution contained silver nitrate, the addition of a few drops of dilute hydrochloric acid will probably cause some silver chloride to be precipitated because the solubility product of this compound has been exceeded. However, there are still many silver ions in solution, and the addition of each extra drop of hydrochloric acid will cause more silver chloride to come out of solution. But even when the number of chloride ions in solution equals the number of silver ions, not all the silver chloride will have been precipitated. This can be remedied by adding more hydrogen chloride, since raising the concentration of chloride ions automatically reduces the concentration of silver ions. It is because of this effect that in qualitative analysis the majority of reagents have to be added in excess. Otherwise small, but significant quantities of ions which should be completely removed in Group II remain in solution and upset the identification of other metallic ions in later groups.